"Who says an old lady can't drive?" You just kind of have to roll your eyes and keep going when anachronistic lines like that show up in animated movies in this day and age. The Ice Age film series certainly has never been known for its cutting edge humor, animation, storytelling, character development, or plot innovations, yet here we are, a full decade since the release of the first film in the series, and the thing just keeps on ticking. 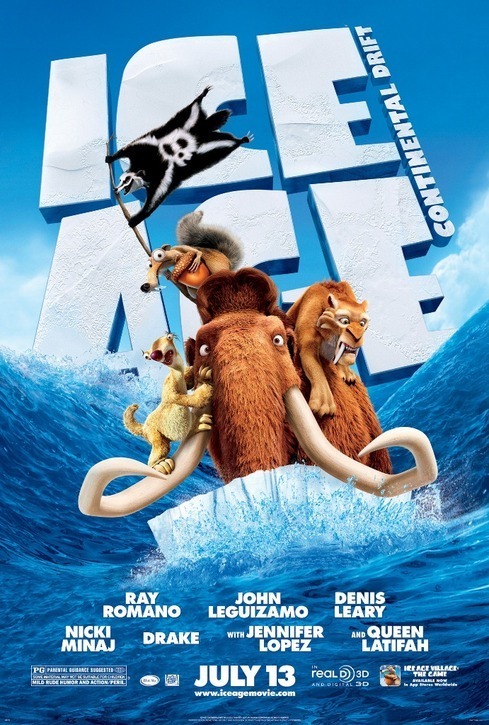 To bring you up to speed, the Ice Age series is the continuing adventures of a Wooly Mammoth named Manny (Ray Romano), a sabretooth tiger named Diego (Denis Leary) & a sloth named Sid (John Leguizamo). They were first brought together to protect a human baby, then to relocate their herd, then to fight dinosaurs, I think, and now to get back to their home after a continental shift causes them to be separated from their family. The characters were never all that memorable, save for some of Sid's antics, and could barely sustain one film, let alone the four they've now been in. The filmmakers have wisely added peripheral characters with each installment (a love interest for Manny (Queen Latifah) & two possums (Stifler & Josh Peck) in Part 2 & a crazed dinosaur hunter (Simon Pegg) in Part 3) though they've now piled on so many characters in this fourth installment, it's hard to tell any of them apart anymore. When Manny, Sid & Diego get separated from Manny's family, which has now grown to include daughter Peaches (Keke Palmer), they are set adrift in the ocean on an iceberg, along with Sid's crazy grandmother (Wanda Sykes). They run afoul of a band of pirates, led by the primate Captain Gutt (Peter Dinklage), and they go on all manner of adventures after this, including a high seas escape, commandeering a ship, gathering a band of small animals to aid in their fight, and avoiding the wily call of a group of deadly sirens. The film is chock full of great character actors in supporting roles, including Nick Frost, Alan Tudyk, Rebel Wilson, Aziz Ansari, Josh Gad, Alain Chabat, & a hilarious cameo from Patrick Stewart, but all of the major voice work is given to fairly indistinguishable "celebrities." Jennifer Lopez is nothing but bland as a female sabretooth. Drake is equally unmemorable as the object of Peaches' affection, and Nicki Minaj has the most grating & out of place voice as another wooly mammoth. There's undeniably a ton of diversity in that cast, particularly when held side by side with other animated films from other major studios, but I don't honestly know how much that matters in an animated film. It's not like the voice of the performer gives away keys to ethnicity (unless they sound like Minaj, who must have thought she was voicing a character on The PJs or something). I don't want to get into a lengthy dissertation about this, but I think it's valid to question whether a voice actor's race or ethnicity have any factor on the story, beyond their potential to bring in a more diverse audience? There's plenty of good voice work happening here, just nothing beyond the level of commitment you'd expect from professional actors being paid to do their job. Dinklage is probably the ace in the cast, and I'm surprised no one's thought to tap into his potential as a voice actor before now. He's appropriately menacing and brings a new dimension to this series as its first true villain. Leguizamo is also pretty good, as is Frost & much of the remaining cast I had mentioned previously, but there's nothing here to write home about. My biggest issue with this series is that it's very much like an animated cartoon series from the late 80s or early 90s. The problems the characters had to deal with in the last installment are a distant memory by the time the new installment begins. For example, in 3, Diego was dealing with getting old and soft, but because that was conveniently wrapped up by the end of that film, it's a non-issue in this one. None of these characters do any sort of developing from film to film. All the development is done by the end of the film you're watching. I know I'm nitpicking here, but when you're expecting parents to shell out premium ticket prices, you've got to bring more to the table. Dreamworks is only just now coming to this realization, and hopefully Blue Sky will follow suit, but I doubt it. When you take all that I've mentioned into consideration, and add in the fact that this film has the most ridiculous, deus ex machina conclusion imaginable, there's no other conclusion to draw other than the fact that this franchise just needs to be put to bed. Two reasons I actually would recommend seeing it, however, are The Simpsons' short that precedes the film "The Longest Daycare." It's everything you love about The Simpsons (spot-on satire & Ayn Rand jokes) in a quick and awesome short about Maggie. Also, the epilogue to the actual film itself, where the squirrel Scrat discovers the lost island of Scratlantis, feels like the logical conclusion to that character's arc. Let's all just pray that enough is enough.